Off to the Royal Palace of Madrid? See our insider advice for a queue-free visit. We also inform of opening times and phone numbers! The Solemn changing of the Guard at the Royal Palace takes place on the first Wednesday of each month unless it’s too hot or there are official events on that day. During summer it’s not held frequently (because of heat). For the palace visit you can try to come either in the morning, about 10 minutes before the opening time, or during lunchtime or in the evening, about 2 hours before the closing time. Plan to spend at least 1,5 hours exploring the Palace. During high season EU citizens have the right to free entrance from Monday to Thursday from 6 p.m. to 8 p.m. Coming at 5:30 p.m. is the best solution to avoid queues. 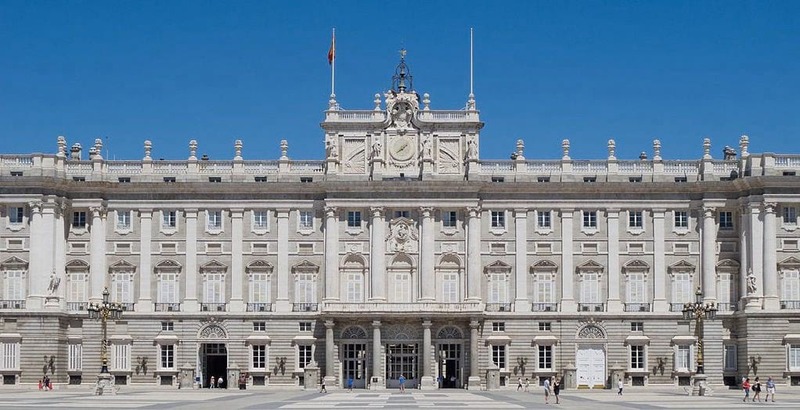 You can purchase tickets to the Royal Palace of Madrid here. You’ll have the option to choose the date and time of your visit. The longest lines for the Royal Palace during the low season can be seen before 11:00 on Wednesday, when the ceremony of the Changing of the Guard takes place. The official one takes place every first Wednesday of the month and attracts really big crowds of tourists and locals. From 4 p.m. to 6 p.m. from Monday to Thursday the entrance is free for all EU citizens. The best way to skip the queues on weekdays is to come either at opening time or at about 3 p.m.
On weekends the queues are generally longer than on weekdays (except Wednesday). Feel free to comment or give your opinion on Royal Palace of Madrid. However, please agree to respect our terms. Please don’t post defamatory, insulting or disparaging comments- as we will have to moderate them. Instead, explain what happened in a factual way.